Windows can play a part in the building's means of egress, allowing occupants to escape to the outdoors in case of emergency. These windows, typically located in bedrooms, should open to the outside without special hardware. They should also have an unobstructed open portion with no dimension less than 15 in. (380 mm) and with an open area of at least 3.8 sq. ft. (0.35 m2) as shown in Figure 85. For example, a window with an opening which measures 18 x 30 in. (450 x 750 mm) would conform to this requirement. Windows intended to serve as egress windows should have a sill height no more than 39 in. (1.0 m) above the floor, and not be more than 23 ft. (7 m) above ground level. Access can be improved to windows high on walls and intended to serve as egress windows by using built-in furniture. 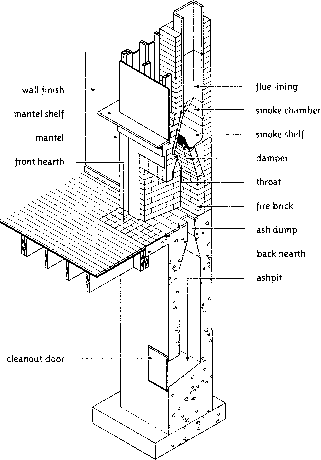 The furniture can act as a step, allowing easy escape in fire situations.